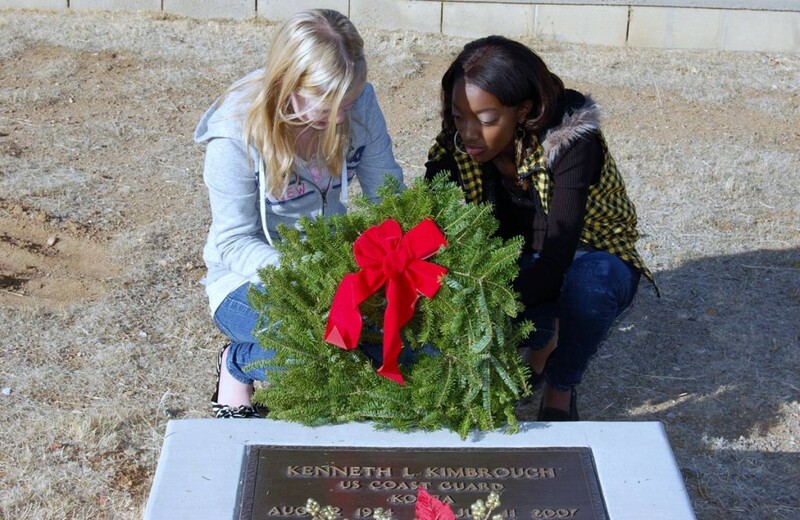 Brinna Petland (L) and Taylor Lee (R) placed holiday wreaths on veterans' graves at the Palmdale Cemetery Saturday as part of Wreaths Across America. PALMDALE – About two dozen students from the Shadow Hills Intermediate School Builders Club took time from holiday festivities this weekend to pay tribute to military men and women who gave their lives for their country. Justin Brewer took part in Wreaths Across America. 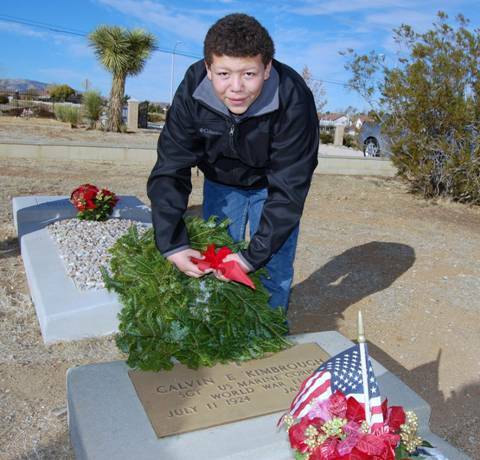 The students joined about 30 residents at the Palmdale Cemetery Saturday as part of Wreaths Across America, a national event that recognizes the service and sacrifice of veterans by honoring them with a wreath at their graves during the holidays. The Shadow Hills Builders Club helped generate wreath sponsorships for the 33 veterans interred at the Palmdale Cemetery. “I think it’s very important to lay these wreaths because we’re not only honoring them, but we’re showing them that they’re not forgotten even though they are deceased,” said Shadow Hills 7th grader Brinna Petland. The Wreaths Across America ceremony in Palmdale began about 9 a.m. with the Pledge of Allegiance, a Moment of Silence to honor the fallen, and a brief appreciation ceremony, which included guest speakers Jeff McElfresh of Buck McKeon’s office, Lancaster Cemetery District Trustee Dave Owen, Palmdale School District Superintendent Roger Gallizzi, and Palmdale School District Trustee Sandy Corrales-Eneix. Students also shared what they learned about patriotism and the veterans community. 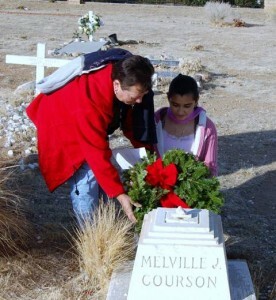 Following the ceremony, students carefully laid holiday wreaths upon each headstone in the cemetery. 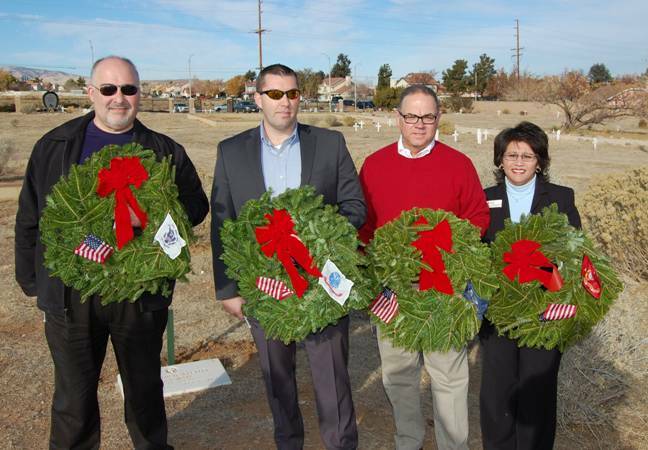 (L to R) Dave Owens, Jeff McElfresh, Roger Gallizzi, and Sandy Corrales-Eneix spoke at the Wreaths Across America ceremony in Palmdale Saturday. Veteran, Angel Cubero, attended the ceremony with his son Kristian, and said the event was especially important for his son, given the family history. “I just want to give back and say thanks to the people who literally died for us,” said Kristian Cubero. Student Justin Brewer said while he felt honored and privileged to take part in a ceremony honoring veterans, the event was only a starting point for giving thanks. Corrales-Eneix hoped more students would follow the example of Shadow Hills Intermediate School. 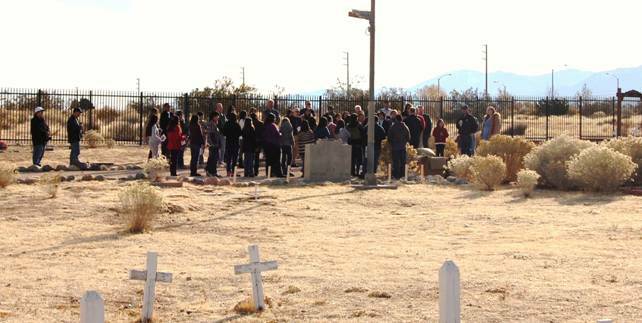 The Palmdale Ceremony was one of two ceremonies taking place in the Antelope Valley Saturday as part of Wreaths Across America. Another ceremony was held, simultaneously, at the Lancaster Cemetery and was headed by cemetery manager Dayle DeBry.